NTS. 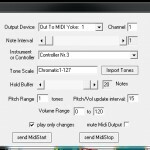 MIDI IN/OUT config for PC/MAC setup. For final solution ignore PD on LHS – this is for the one machine demo.